Having already discussed all of the previous Stations of St. Alphonsus’ Way of the Cross, here, here, here, here, and here; we now turn to our sixth and final post on the Via Dolorosa. This article on the 13th and 14th Stations will conclude our series. Once again, for the first time since the fourth Station, we return to our Lord’s most Sorrowful Mother. Separated from Christ by the crowd and the soldiers, she is at last re-united to her son. For the second and final time, St. Alphonsus addresses the Blessed Virgin directly. He calls her the “Mother of Sorrow,” and indeed she is. According to a moral interpretation, St. Alphonsus implores our Lady to receive him just as she received the dead Jesus, holding him in her arms and pressing him to her bosom. Only through his prior consideration of the “unutterable tenderness” of the Mother and the “love unutterable” of her Son, can St. Alphonsus dare to ask this great favor. Trusting not in our own merits, but in the love and mercy of almighty God which is communicated to us through the Immaculate Heart of Mary, we beg the Good Lord’s pardon and make some small act of love in return. 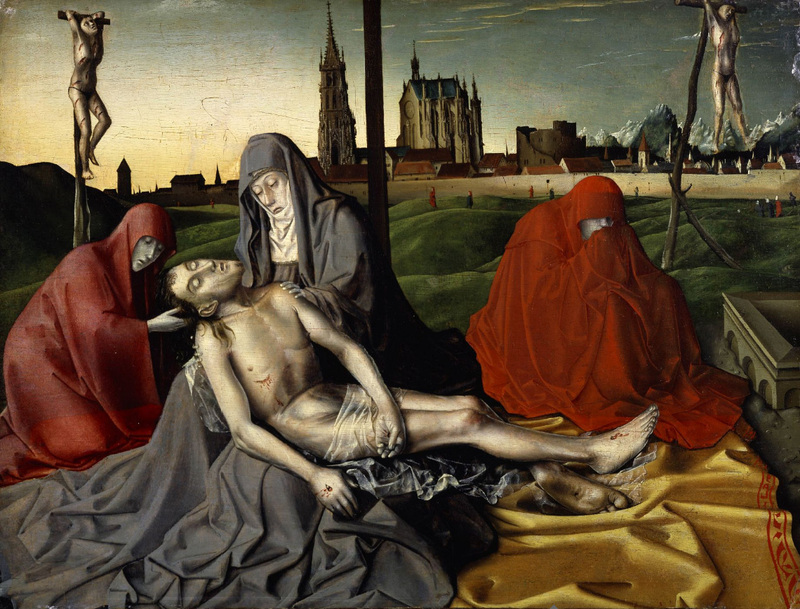 While the Gospel accounts relate that Joseph of Arimathea and Nicodemus prepared the body of Jesus for burial and laid it in the tomb, St. Alphonsus recalls the venerable tradition that the Blessed Mary was central to this activity as well. Indeed, it is most reasonable to suppose this: How could a mother stand by as her own beloved son is buried? Recalling, in this final Station, the significant role which Mary played in Christ’s life, the Marian Doctor brings us to consider her tender actions in burying her son and her Savior: “[She] arranged [his body] in the sepulcher with her own hands.” Those hand which first wrapped the Christ in swaddling clothes, now wrap him in burial bands. St. Alphonsus invokes the dead body of Jesus directly, “Oh, my buried Jesus.” Indeed, he is right to do so, since the divine person of the Eternal Word remained united to the lifeless body which was laid in the tomb. Just as we may rightly plead the mercy of the blood and water which gushed forth from the Heart of Jesus (in the chaplet Divine Mercy), so too we may pray to the entombed body of our Savior. Though his soul is no longer present, the person of Jesus, which is the Eternal Word himself, lay dead (i.e. personally united to a corpse) within the tomb. And, although the practice of adding a 15th Station for the Resurrection is to be ignored and, when possible, rooted out; the Doctor of Morals cannot help but call to mind our faith in Jesus’ Resurrection. It is the bodily Resurrection of our Savior which is the efficient cause of our own glorification in the general resurrection on the Last Day. Thus, the Teacher of Prayer leaves us looking toward Heaven, toward the great hope to be fulfilled in Life Everlasting. Is it possible to get a copy/download of the six episodes? I'll forward you the word document with all six meditations.